MILLION AIR ZOOM map scale of 1: 500,000 of southern England and Wales! Quickly discover this map that covers the entire south of England and Wales on a double sided sheet 1: 500 000. 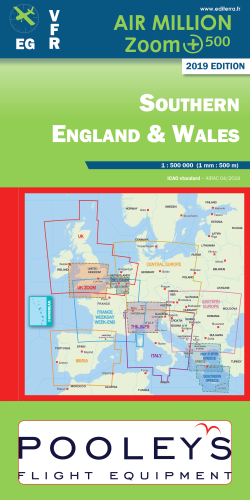 The map contains all information necessary to AIP flight: airspace SFC to FL180, controlled areas and restricted areas, airfields, radio means etc. All with the new graphic AIRMILLION ZOOM for maximum clarity and simplicity.